Situated in Pezenas, this hotel is within 2 mi (3 km) of Hotel d'Alfonce, Place Gambetta, and Musee de Vulliod St-Germain. Mas Gabriel Winery and Allegria Vineyard are also within 9 mi (15 km). Located in the heart of Pezenas, this hotel is within a 15-minute walk of Place Gambetta, Musee de Vulliod St-Germain, and Hotel d'Alfonce. Mas Gabriel Winery and Allegria Vineyard are also within 9 mi (15 km). Located in the heart of Pezenas, this hotel is within a 5-minute walk of Place Gambetta, Hotel d'Alfonce, and Musee de Vulliod St-Germain. Mas Gabriel Winery and Allegria Vineyard are also within 9 mi (15 km). How Much is a Hotel Room in Pezenas? Hotels in Pezenas start at $52 per night. Prices and availability subject to change. Additional terms may apply. Planning to spend a rollicking few days in Beziers? Through Travelocity's booking page, you will find several places to kick up your feet in Pezenas. The center of Pezenas lays claim to 5 excellent hotels and apartments within 6 miles (10 kilometers). 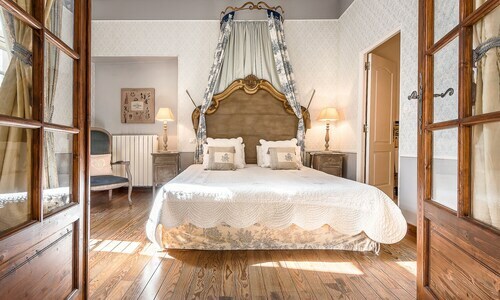 A convenient option for the trip where you prefer to base yourself just a stone's throw from the middle of Pezenas, is the Hôtel Le Saint Germain. 13 miles (21 kilometers) from the town center of Pezenas, you will come across the Oz'Inn Hôtel. Alternatively, the Le Palmyra Golf Hotel can be found about 13 miles (21 kilometers) away. 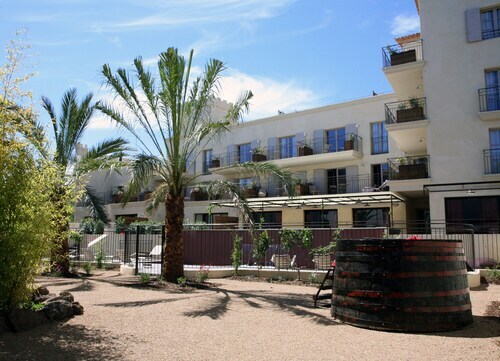 The Natureva Spa and the Hotel Helios are other alternative options around Pezenas. If you have the time, why not spread your wings and investigate the many attractions dotted around Languedoc-Roussillon during your stay here? Languedoc-Roussillon is famous for its beaches, coastal plains and rivers. Popular visitor draws are ruins. Common activities in this area of France include snowboarding. Cap d'Agde is found 12 miles (19 kilometers) to the south of Pezenas. While here, you can stop by the Cap d'Agde Beach. Travelers planning to stay a night or two in Agde can pick from the Hostellerie La Bergerie du Cap and Hôtel le Donjon. For an alternative option, you might like to stay at Cap d'Agde, which can be found 13 miles (21 kilometers) south of Pezenas. While you are in town, take the time to visit the Rochelongue Beach. Places to stay in Cap d'Agde include the Thalacap Résidence and Résidence Pierre & Vacances Les Rivages de Rochelongue. Just because you're on vacation, shouldn't have to mean you can't expand your obsession for sports. You'll find Park&Suites Arena 30 miles (45 kilometers) to the east of Pezenas. Those sports fans that want to find a bed near the stadium can compare between the San Marco or the Inter-Hotel Neptune. For those travelers flying through Montpellier - Mediterranean Airport, you might choose to book a bed at Le Domaine de Verchant Relais & Châteaux, or Holiday Inn Express Montpellier - Odysseum, which are both conveniently located nearby.